Here Jesus refers to a certain obstinacy; one that he himself faced many times from the Pharisees. They refuse to listen to him, having their minds already made up before he even engages them. They become blinded by their own viewpoints and dispositions. In his teaching on divorce Jesus refers back to the original plan for marriage from the time of creation. The union of husband and wife in marriage is a wonderful bond of love. The commitment that each partner in the marriage covenant makes is a whole-hearted commitment that grows and develops over time. The love between husband and wife is a sharing of self with the other in both giving and receiving. Love is seen as so powerful that the couple participates in the creative activity of God in bringing children into the world and beginning a new family. The sacrament of marriage has great dignity. The love shared between a husband and wife reflects and gives witness to the love God has for His people; the love Christ has for His Church. Whatever state in life we might live — married, single or celibate — we appreciate and value the witness of marital love. Think of the many married couples you might know who genuinely witness this love. It is uplifting when we encounter them and see how they love each other. I remember visiting a couple who had been married over 60 years. It was beautiful to hear the husband speak of his love for his wife and the wife of her love for her husband. It was not only evident in what they said but how they said it and how they interacted with each other. We all know couples like this. In this love that they share they witness to the love of God especially for their children who, many times, first come to know the love of God through their parents’ love. At the same time we must acknowledge that Jesus’ teaching on marriage and divorce is one that is not readily accepted today. The institution of marriage is under attack by those who would seek to redefine it; and divorce rates in the western world are very high. Serious reflection on the dignity of marriage is needed today both from a natural perspective and from a faith perspective. The natural perspective of the union between husband and wife and the formation of family and the sacramental witness of love are worthy of our attention and reflection. At the same time we should be moved with compassion when couples find themselves in difficult situations that might result in a separation. The love between a husband and wife in the union of marriage is at its heart a relationship. The relationship of giving and receiving, loving and being loved, forgiving and being forgiven all lend to building of trust and openness to the other which in itself becomes an experience of love. The dynamic relationship grows with time and, with grace, the love of Christ for the couple, their family and the Church becomes more manifest and visible. Today we pray in thanksgiving for the gift of marriage and for all married couples that they may find, in their love for one another, the love of Christ. Msgr. 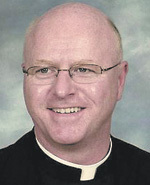 Prior is pastor of St. John the Evangelist Parish, Morrisville.